Kids Gift Guide & Reviews! 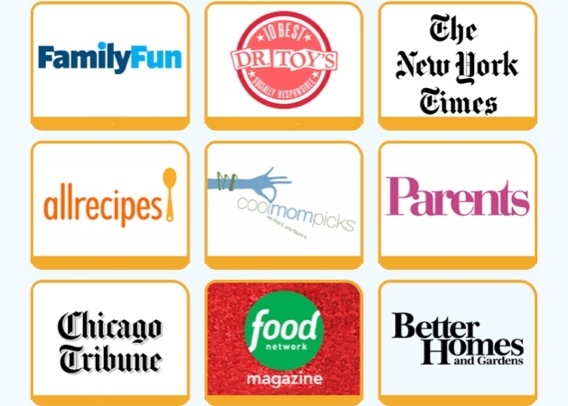 We are so thrilled that the most prestigious food and family magazine, newspaper, podcast and TV editors, gift reviewers, and toy experts have recommended Kidstir since our founding just a few years ago. Perhaps most importantly, we have felt the love of families around the country for cooking kits age appropriate for 5 to 10 year old children. There is no greater feeling than having our Kidstir kids cooking kits gifted to excited kids during the holidays and making their birthdays happy year-round! Parenting & Family Publications – Parenting editors adore Kidstir! Parents who get deeply involved in raising kids often turn to top magazines and and online parenting publications for guidance on the best gifts for kids and Kidstir makes the grade! Major News Organizations – Newspapers are big fans of Kidstir! Metro news publications from coast to coast have all suggested a little taste for our kids cooking as a gift subscription that lasts all year. Real families – Parents, aunts and uncles, grandparents and kids. These our proudest endorsements yet… read on and feel the love! Thank you so much! We love these kits so much. I appreciate you mailing them. Serena Jean G.
This was such a neat gift for my 6 year old, and it was so much fun to cook the recipes with her. I am always happy to have help in the kitchen! Megan K.
I gave my 9 year old grandson a Kidstir subscription last year for his birthday. He loves it. I would like to renew the subscription for another six months. Lynn P.
Thank you so much! This is a gift for my granddaughter and I am so excited for this! Kathy S.
I really appreciate this elevated level of customer service. Katie H.
My daughter has been receiving your kits for the past year. She loves them! Susan R.
Last January I ordered a year subscription for my granddaughter and she loved it. Now her sister would like a subscription. Teri L.
I purchased a Kidstir subscription for my daughter for Christmas last year, and she has thoroughly enjoyed it! Sarah L.
My parents got a subscription for my daughter for Christmas. She has loved all of the kits this year. Heather I. We have been Kidstir subscribers for almost a year now… our current binder is almost full of the yumminess..we love our subscription! Thanks for such a great product! Amy B. We have thoroughly enjoyed our 12-month Kidstir subscription in 2016. Sherry H.
I bought a year subscription for my nieces last year and they absolutely loved it. It’s become a monthly tradition for us to bake together and I don’t want it to end. Ashley S.
Couldn’t have said that better!